Yep once again we kick off the New Year with this fabulous promotion. Everyone that connects with Stampin'Up! during this two months can benefit from FREE STAMPS !!! AS A CUSTOMER - Spend £45 and choose a FREE stamp set of your choice, there are four fabulous ones to choose from see below. 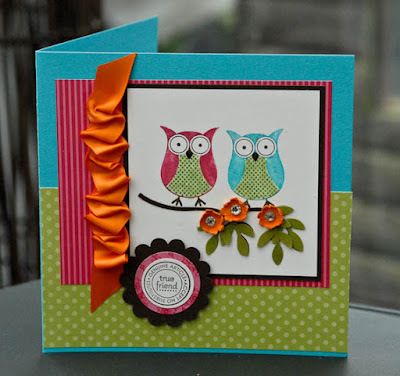 HOST A WORKSHOP - Host a Stampin'Up workshop with me and if the total sales for your workshop reaches £300 you will get to choose a FREE stamp set! more free stamp sets!!! Join my Team- Become a Passionette during the Sale a Bration period and choose an EXTRA FREE STAMP SET in your Starter Kit, the set can be of any value. How fab is that? This makes the whole Starter Kit such a good deal and now is the perfect opportunity for you to take the plunge and start your own business, I can show you how you can earn enough money to take your whole family on holiday. I am looking forward welcoming lots of new people to our fun team and you might want to read a bit more HERE about the types of demonstrators then email me for more details and a no obligation chat. You will get a bumper pack full of business supplies and tools to help you on your way. LOOK WHAT SETS ARE ON OFFER !!! I have used a tempting Turquoise card blank, Old Olive and Melon Mambo designer papers and Pumpkin Pie satin ribbon, I adore this ribbon in this particular colour. This card is one of a full set and I will reveal more tomorrow. I coloured the owls using markers. For now make your list and decide which set is going to be yours first, then email me to place your order. Monica, what a darling card! The colors are very cheerful, the 3D flowers are super cute, and you have to love that scrunched up ribbon. Satiny and touchable! Thanks for the sneak peek at the saleabration sets Monica. I am assuming that ours in Australia will be the same. They all look like must haves to me. Your card is wonderful, as are all your cards,and Yes, you will love the owl punch it is fantastic. Hi Monica, thank you for the lovely comment you've left on my blog and also for becoming a follower. I've just had a little nosey round your fab blog, WOW! I've become a follower and will be back to have a good old rummage really soon. Happy New Year. 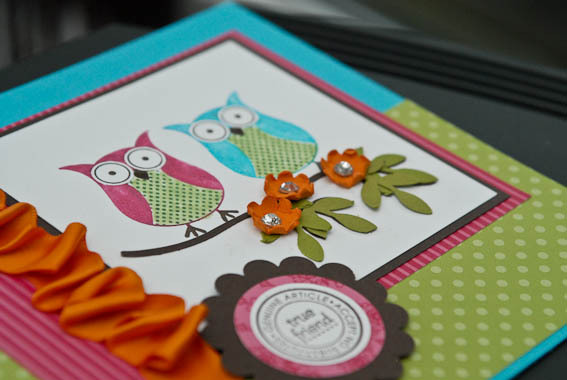 Wow gorgeous card and the owls are so adorable. Your card is so super cute. I LOVE owls & this set is a must have. Had a look around your blog & am now a follower so I can see more adorable things you create.